A while back, I shared with you an excerpt from the interview I did with Bill and Jan Leon, two very successful wholesalers in Florida. Well, today I have more wholesaling nuggets from the Leons. Just a brief overview about the Leons: Since 1989, Bill and Jan (a husband and wife team) have owned and operated WJL Financial Group outside of Miami, Florida. Together, the two real estate investors buy and sell 90 to 100 homes a year. 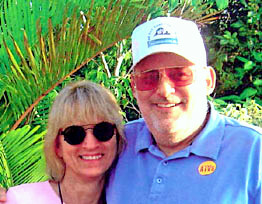 Bill and Jan are also the owners of the Broward Real Estate Investment Association. How do you sell houses once you have a contract on them? We round up all our investors and have them all go look at the property at the same time. Since we tell the seller that we have no intention of keeping the property, that it is our intent to sell it, most of them are pretty gracious about having a lot of people come. Then we set up an open house. Lots of times a lot of the properties are vacant. I send out an email that says, “Look, be there Saturday from 1:00 to 3:00 and you’ll get to see it.” Lots of times we’ll already have an agreement subject to the investor seeing it. But again, you know, if you have a property and you advertise in the paper “Open house 1:00 to 3:00,” it creates a frenzy, which is good. In fact, many times I have a problem because a lot of people want the property. Generally, it’s the first one to come to the table with a check. Also, many times we’ll say to the sellers, “Look, the house is vacant. Would you allow me to put a lockbox with a key in it so you don’t have to travel 35 or 40 minutes every time I want to do an inspection?” We would indemnify the people; in other words, if something happened, we would take care of it. But again, we’ll put the lockbox on it and people will go take a look at it and that’s how we do it. How do you screen potential buyers to make sure they can actually close? So generally, that’s why we don’t allow end user financing. It’s not secure and the time frame is tight. Many times these properties have to close in ten days to three weeks and conventional financing just doesn’t give them enough time to do that. What kind of financing do you recommend? People who are looking to be investors in this business need to try to find hard money lenders in their area. Hard money lenders are great. Even if you have capital, it allows you to leverage the amount of properties that you can buy at any particular time. Now people say, “Well, hard-money loans are expensive.” In Florida, the rate is usually two or three points up front, and anywhere from 14% to 15%, interest only. They’re one year balloons. Most hard money lenders require a survey and insurance that covers the property when it’s vacant. It’s advantageous to take out a hard money loan and fix up the property. When it’s all brand-new and clean, you call up your conventional financing and the house is going to appraise at a much higher price. I think it’s a tremendous advantage to have hard money lenders. If you really look at the cost of an interest-only loan that you’re only going to have for five or six months, it’s really not that much more expensive than conventional financing when you figure out all the upfront costs that you have through a conventional loan. To listen to the full interview with the Leons and to access our Hard Money Lender guide with a list of lenders in your area, sign up for a Premium MyHouseDeals.com account here.